4.3.1.1. Use or mention, or permit the use or mention of, their military rank or grade and military service affiliation; BUT they must clearly indicate their retired or reserve status. 4.3.2.1. Use or allow the use of photographs, drawings, and other similar media formats of themselves in uniform as the primary graphic representation in any campaign media, such as a billboard, brochure, flyer, Web site, or television commercial. For the purposes of this policy, “photographs” include video images, drawings, and all other similar formats of representational media. There’s little doubt that Murry has lawyered the photo and concluded that he’s only in 49% of it but there’s a certain point when you go through too many loopholes to make a point you end up down a rabbit hole. There can’t be too many situations where the “actual performance of duty” as a military attorney requires you to put your cap on your child backwards so your name shows and not count towards the percentage that you are in the photograph. 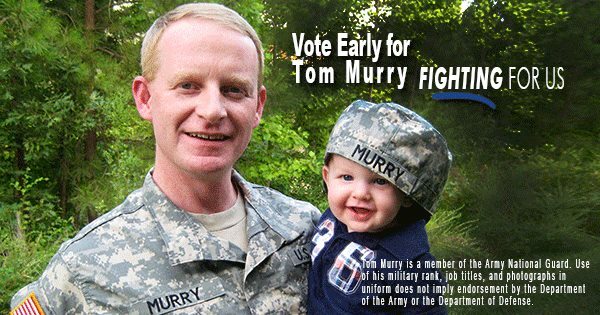 Murry’s ad also uses the phrase “FIGHTING FOR US” implying active duty in the field of battle. Other rules ban campaigning while on active duty. Murry has been campaigning for at least the last 4 months. This would be incompatible with actual active duty and the multiple meanings are exploitive. Murry’s willingness to serve should not be discounted, but his willingness to take premature credit should give pause. Update 2: Murry’s campaign Facebook page also shows him in uniform with fellow Republican Chad Barefoot at what appears to be a partisan event with students at NC State. This entry was posted in Uncategorized and tagged Gale Adcock, House District 41, NCGA, Tom Murry. Bookmark the permalink. ← Who’s been buttering Barefoot’s bread?